Circular breathing alters the brain, I’m sure of it. I play the saluang, a bamboo flute of the Minang people of West Sumatra, Indonesia, which requires circular breathing, breathing in through the nose while simultaneously blowing out through the mouth. The effect of playing a single, uninterrupted note for thirty, forty, fifty minutes is amazing, and can’t be explained away as hyperventilation. Much more is happening. My research recently has led me to rediscover an old friend, the shakuhachi. The shakuhachi, a bamboo flute of Japan, is the most responsive instrument I’ve ever come across. It is one with the breath, the mouth shape, head position and posture of the player. 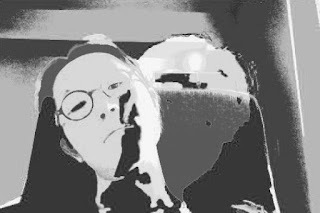 A change of breath, a small head shake, even a slight pursing of the lips will change the sound. A disciplined player, with perfect control, can bring the sound from an extreme distance to a close up presence and back again, or gather white noise from nothing, focusing it into a pure tone before allowing it to blur into white. As a listener, the experience can be calming yet astounding. I wonder how the sound effects the brain of the player, or the brain of the listener. Lately I’ve been looking into the nohkan, the bamboo flute that accompanies noh, the masked dance drama of the samurai. It’s construction is unique, assuring that blowing won’t give you the same note an octave higher (as on a western flute). During lessons in Tokyo, when my teacher and I played at the same time, the slightly different tuning caused distortions that I hadn’t heard since attending a Stevie Ray Vaughn concert, and I was surprised that such a sound could penetrate my brain without overwhelming my ears with sheer volume. This was a unique and exhilarating experience. I am curious to find out what effect this has on the human brain. 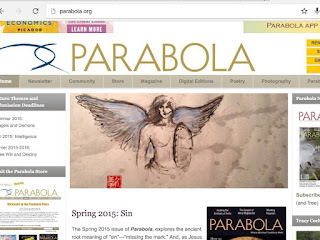 (Kumiko's post) Archangel Michael-Sumi is on Parabola magazine!! 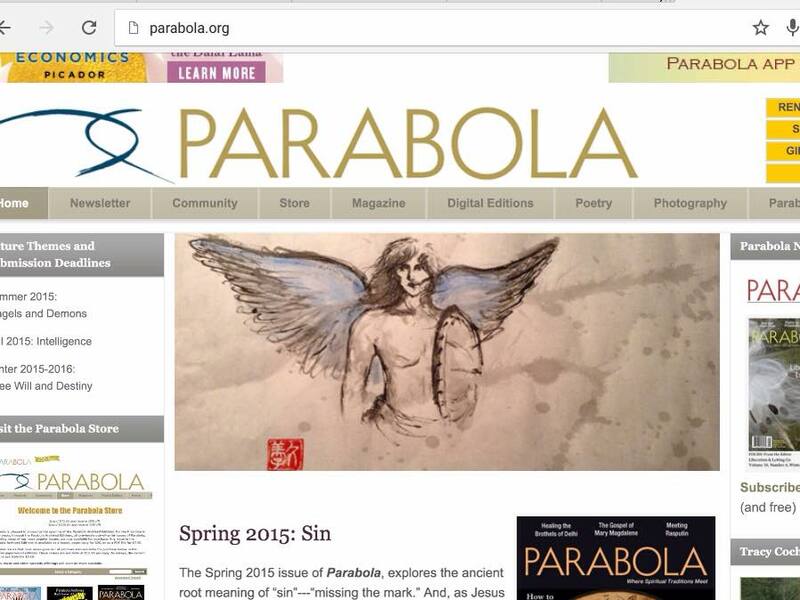 One of my Sumi paintings is being used on Parabola magazine's web site cover slide show (www.parabola.org) . This painting of Archangel Michael will be featured in their Summer issue with the Italian epic "Orlando Furioso". 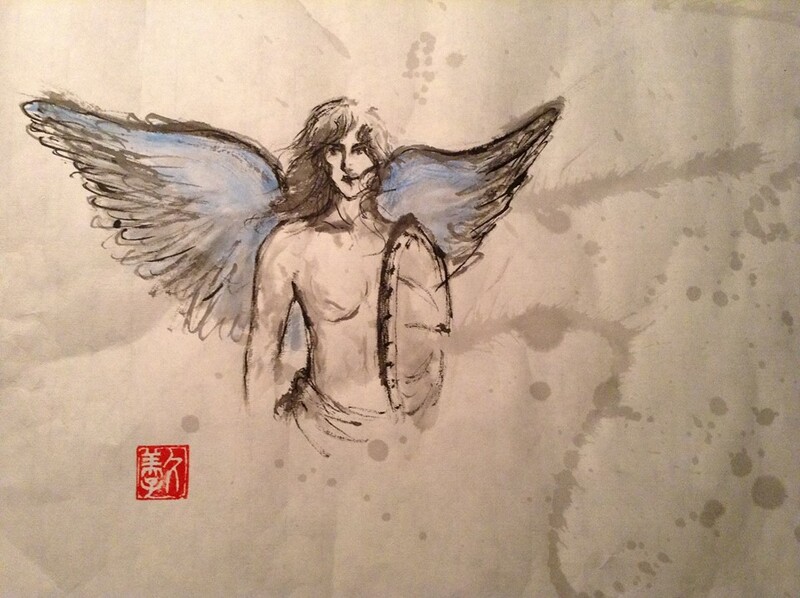 Thank you angels and everybody for supporting my art! In 2015, Soju Projekt once again took part in Sakuracon. Because of the enthusiasm of the audience at our 2014 lecture-demonstrating 'What is Noh?' we chose to present a more specific lecture focusing on the theme 'Traditional Asian Music and Theater in Anime' using specific examples, followed by a live performance of a newly composed piece that illustrates many of the topics discussed in the lecture. The Noh-inspired performance featured gamelan music from Indonesia, music from Japan and the Himalayas, and interactive computer projections of neo-traditional sumi-paintings. It's always a thrill to present at Sakuracon. It is truly odd to lecture to and perform for an audience of steampunk robots, dwarves and Sailor Moons, but they are always attentive, and their questions well-thought out. I am always pleased by their sincere interest in the traditional arts of Asia. The popular samurai anime "Samurai Champloo" defied convention by effectively using the hip-hop music of Nujabes, Tsutchie, Fat Jon and Force of Nature to enhance the anachronistic feel of its alternative Edo setting. But examples of traditional music in anime are not difficult to find. The shakuhachi and Noh flute often enhance the eeriness of a scene, and one of the 'villains' in 'Blade of the Immortal' even performs Noh chant before each duel. More surprising is the increasing presence in anime of theme songs and background music performed on or inspired by gamelan, the traditional knobbed-gong ensembles of Java and Bali. Interestingly, anime may have had a lot to do with the spread of gamelan not just in Japan but in the United States as well. Gamelan inspired composers such as Impressionist Claude Debussy and American Lou Harrison, but its popularization was more likely due to popular performers such as the influential rock performer Peter Gabriel. Progressive rock mainstays King Crimson have also sited gamelan as an influence for their rhythmically complex, interlocking pieces. Still, the gamelan-influenced theme song of the anime classic 'Akira' by Shoji Yamashiro may have been the first exposure of many in Japan and the United States to the music of gamelan. More recently, composer Kiyoshi Yoshida composed the theme song for the disturbing anime 'Shigurui' scored for the unusual combination of gamelan, Japanese taiko, didgeridoo and strings. The influence of gamelan is also clear in the theme from 'Ghost in the Shell: Arise,' composed by Cornelius (Keigo Oyamada). Other Noh esthetics in play in many anime include the concept of 'mu' or nothingness. Silence is used to great effect in many anime, including 'Mushishi,' 'Ergo Proxy' and Makoto Shinkai's beautiful "Five Centimeters per Second." The traditional esthetics mentioned in Kenneth E. Lawrence's lecture on traditional Asian theater in anime were illustrated in the performance that followed the lecture, Sakura Projekt's performance of the piece 'Mist.' While the form of the piece were inspired by Noh theatre, the libretto, written by Kenneth E. Lawrence, was inspired in equal parts by two geniuses, Zeami Motokiyo and American author Gene Wolfe. 'Mist' is the story of a samurai warrior who, due to a brain injury, is unable to recall his past and must piece together his life from what he sees around him. The piece was a collaboration with Golden Heron Gamelan director Jeff Milano, sumi painter Kumiko Lawrence, visual cretor Kaz, taiko drummer Stan Shikuma and electronic musician Kaley Eaton. "Mist" - Performance at Sakuracon 2015. Projekt’s multimedia piece “Mist” was presented at Sakuracon 2015.
n 2015 Soju Projekt once again took part in Sakuracon. In 2014 I lectured on Noh, and I’m always pleased at the interest in traditional Asian theatre, the well thought-out questions and the enthusiasm shown for our performances. 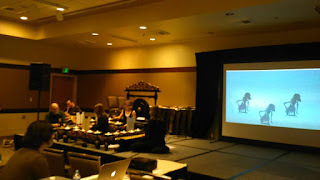 We presented at SakuraCon 2015 on the theme ‘Traditional Asian Music and Theatre in Anime.’ The performance, entitled ‘Mist,’ featured a live performance of gamelan music from Indonesia, music from Japan and the Himalayas, projections of the neo-traditional sumi paintings of Kumiko Lawrence, masks, costumes and video clips. Sakuracon is always such an odd experience. There’s just something about lecturing to and performing for an audience of robots, dwarves and Sailor Moon. But this year again they were attentive and asked excellent questions. I particularly enjoyed composing ‘Mist’ for a mixed ensemble of gamelan, taiko drum, electronics and narration. Kumiko’s sumi-paintings were a nice addition, and Kaz’s interactive computer projections were amazing! Kenneth E. Lawrence’s libretto was inspired by noh theatre and the works of author Gene Wolfe. “Mist” was a collaboration with Golden Heron Gamelan, sumi painter Kumiko Lawrence, visual creator Kaz, taiko drummer Stan Shikuma and electronic musician Kaley Eaton.